Book 3? Heavy metal music!? Niles + ally will get the atk/spd buff as long as one of them uses swap/repo etc. Halloween banner coming soon it looks like. Cool! Yah, it is a Halloween Banner. Niles seems like he's gonna be super fast. Sorry I haven’t been too active lately, the games just been slow. I think a lot of us feel like that right now haha. nah its normal, pretty much the whole forum is feeling it. Korban Dioxide and Marcus like this. its just Fallen Takumi, he isn't a king. Not worth CC/Vantage imo, might as well just do normal Takumi. His bow is more gimmick with pve uses than practical in arena. Minx and Primetime like this. Korban Dioxide and Primetime like this. How can imaginatory people play games? Is she a bot? Stop calling the Tasker app your girlfriend. Evan and Primetime like this. Build your units so you can use them in AA. AA is actually the best experience in the game if you can do it that is. I absolutely have to have Kagero. Lol! Well, that wasn't my first thought as to why but yes more reasons to have her. How did you beat chapter 6 part 5 w/ axe and all 4 survive? 3 Armors + Healer. 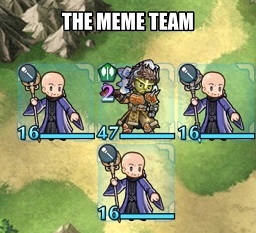 LA Hector wielded axe for my team. Evan and FlashingBlade_Society like this. Armor would do the trick. Definitely. Colorless dragon!? What the hell could that be? That would be crazy ._. Korban Dioxide and FlashingBlade_Society like this. I'm not into this voting gauntlet. I just want feathers. So I voted for fallen Takumi. Cuz it seems like he's always gonna be behind. I'm hoping he's the least favorite. Damn, you didn't have to spend any more than $100. That's nice. I only got Nowi on the Halloween banner.